Kaspersky Total Security 2019 Review: Still The Top Antivirus in 2019? Kaspersky Total Security 2019 is not just a single antivirus software program, but it is a suite full of malware-hounding, anti-hacking and web security tools. When you download it and run it on your PC, you will get a whole lot of things bundled into a single suite, starting with an antivirus program which provides protection during browsing, a firewall for advanced protection within LAN environment, a scanner, a set of parental controls, audio protection and webcam protection and last but not the least, online payment protection. In other words, Kaspersky Total Security 2019 packs in a whole lot of web security essentials. Kaspersky Total Security, Internet Security and Antivirus have always been rated high by independent antivirus tests labs. For decades, the company’s products have held a leading position among the top anti-virus solutions. I do not think that there are many people who will object to the fact that Kaspersky is one of the most successful and reliable companies. If you are not agree with me and have your own point of view maybe bad experience using Kaspersky please share your thoughts under “comments” section, I will be happy to discuss it. So what’s new in Kaspersky Total Security 2019? Kaspersky Total Security 2019 comes with a host of outstanding features that make the security suite a contender for the best PC and mobile security program in the coming days. 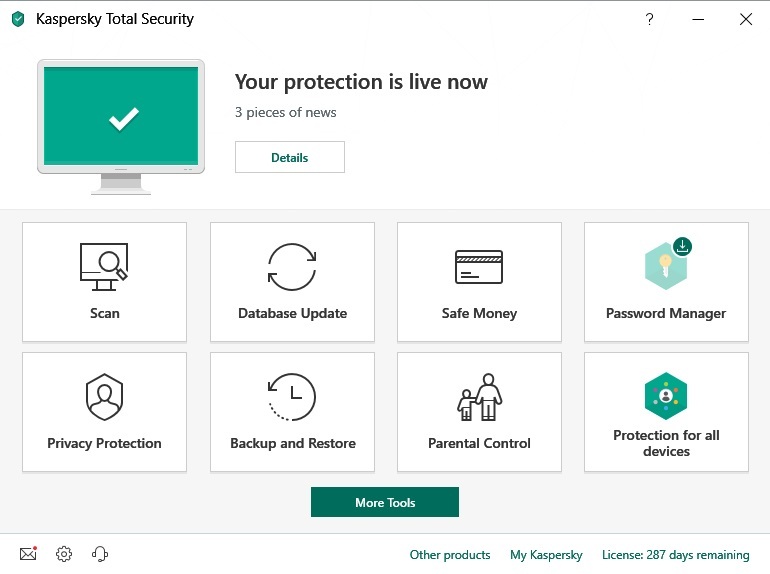 Here’s a snappy overview of the newly added features to the Kaspersky Total Security 2019. Watching notifications is now easier and you can even get notifications after disabling the System Watcher. The notification now comes with more detailed explanation of a threat and the consequences of disabling a specific component, and you can expect more in-depth description of possible consequences of lack of protection against cyber encryptors. The new version of Kaspersky Total Security now also waits for longer before displaying outdated databases after a system wakes up from slumber. Why Should I Choose Kaspersky Total Security 2019 and Not Some Competitive Product? There are quite a few reasons to choose Kaspersky Total Security 2019 over many other similar software programs. Below are a few good reasons I have managed to summarize. The security suite is compatible with a wide range of operating systems and provides high-level protection to all your devices. Total Security 2019 provides excellent proactive and real-time anti-phishing protection. It verifies each and every website you visit and prevents redirects to third-party websites, many of which are spam websites. It also protects your privacy and does not let the cookies and bots to track your web browsing habits. On many websites, your personal information is automatically captured. The new version of Kaspersky Total Security prevents such cases of information stealing effectively. It also has Webcam Protection, which prevents hackers from using your webcam to watch you secretly. The all new Safe Money Technology adds an extra layer of web security, which makes online shopping and online banking all the more secure and hassle-free for you. If you use payments websites or banking websites on a regular basis, you should add this additional layer of security as cyber criminals have become smarter than ever before. The Kaspersky Total Security latest version manages all of your passwords for websites and apps. You can easily store and synchronise your website passwords and access your accounts from anywhere – either from your PC, or from your laptop, or your Android phone, or even a tablet, iPad or iPhone. Just remember the master password and the software program remembers all other passwords for you. Whether you are a business user or a personal user, you might have thousands of files stores on your PC or laptop. The software lets you take local and cloud backup of your data and also lets you save duplicate copies of your confidential files. If you want better protection, you can even encrypt your confidential files. When you encrypt a file, unauthorized users won’t be able to read that file. Also, if you want to delete a file, you can completely ‘shred’ it using the Kaspersky Total Security. You can just sign up for a Kaspersky account for free and manage your web security easily. You can access the security portal from anywhere. And the answer to the title of this review is YES. So it's still one of the best security suites in 2019. While testing Kaspersky Total Security 2019 I found that it is really fast, detects all known threats and includes all necessary features and options to be called the best antivirus solution.